The ninth SuiteWorld has officially kicked off at the Sands Expo and Convention Centre in Las Vegas! The event is the largest annual celebration of partners, business leaders and customers globally. It not only marks achievement and technology advancements, but strives to display the dedication Oracle NetSuite have when it comes to developing and maintaining a solution which supports thousands of businesses globally. Teamwork makes the dream work with Hackathon 4Good returning for another year! Eighty-eight NetSuite guru hackers divided into seventeen teams took part to create prototypes for two chosen non-profits. This technical challenge also demonstrates how Oracle NetSuite are providing solutions for non-profits internationally. This was also highlighted by the founder of NetSuite, Evan Goldberg who addressed this in the session. This year we saw the Hackathon teams meet the challenges chosen for charity partners MANA Nutrition and Art in Action. MANA Nutrition’s mission is to provide life-saving nutrition to children globally. The challenge was to develop an innovative prototype to allow for simpler methods to inputting inspection data on their food lines. The other challenge chosen was for Art in Action. They are dedicated to building creative confidence and critical thinking through innovative visual art programs. Their mission is to ensure that every child has access to arts education through 623 schools in 32 states. The challenge here was to create a prototype to simplify the way the organisation manages the different elements of their curriculum structure. After 12.5 hours the prototypes were then judged by a panel which comprised of NetSuite representatives and those from the non-profits themselves. The International Partner Meeting marks the start of the Grow Beyond topics for the event. This was lead by Craig Sullivan who is NetSuite’s Senior Vice President of Enterprise and International products. The meeting enabled a platform to demonstrate new international product updates and expansion strategies. This in turn highlighted how Oracle NetSuite works hard to make going global easier for businesses. The Partner Kickoff was also a highlight of Day 1 with all attendees being introduced to some of the new and exciting features in development. 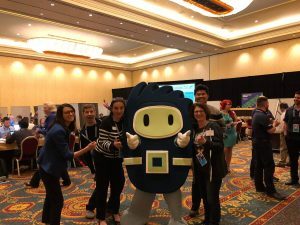 The Kickoff also showcased partner successes and the all-important partner insider’s guide to SuiteWorld so attendees can make the most of this event. With Day 1 drawn to a close, lets see what Day 2 will bring. Don’t forget if you are unable to make the event, you can watch the live streams here.